That's right! I'm also a director! I'm directing an ensemble of six wonderful young people at Boston Conservatory at Berklee in a really daring devised production of two of Sam Shepard's most esoteric pieces. Please come check it out! The very talented Luis A. Mendoza, a freshman at the conservatory, designed this poster and is a member of the ensemble. That's the nature of the kind of the students I work with at Boston Conservatory at Berklee. They're incredibly talented on multiple levels just like this young man. Please come check all of them out! Freshman students of Boston Conservatory at Berklee’s B.F.A. 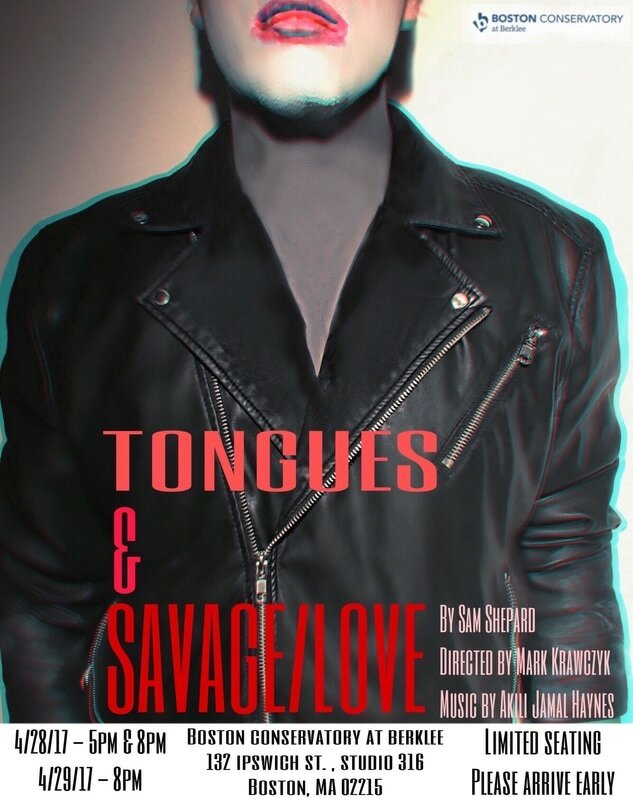 in Contemporary Theater program present two works by Sam Shepard, Tongues and Savage/Love, directed by Mark Krawczyk in collaboration with the ensemble. Mysterious and lyrical, Tongues and Savage/Love comprise the culminating project for the freshman contemporary theater class as they implement a year's worth of training in experimental theater techniques. These astonishing theatre pieces show the inexhaustible gifts of writer Sam Shepard, and the burgeoning talent of these young performers. I'll be performing as John. 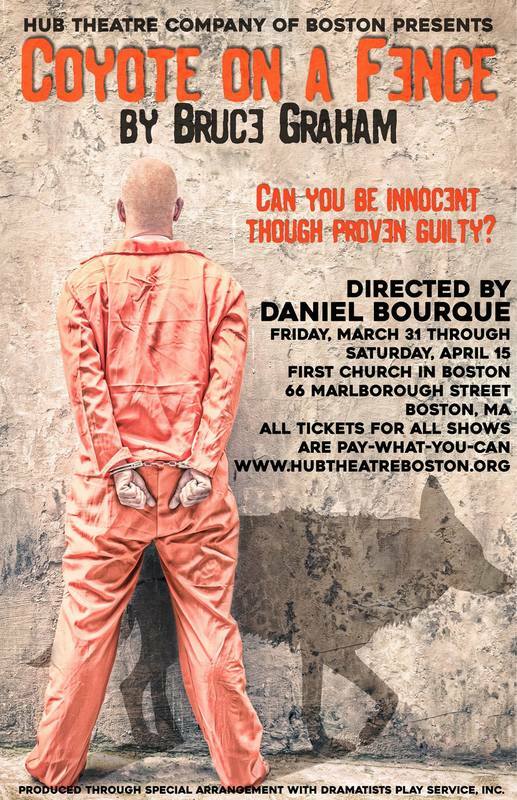 A gritty Death Row drama that will have you questioning your beliefs about morality and justice. John publishes a newsletter from his cell memorializing the executed inmates, focusing on their humanity rather than their crimes. His new neighbor will be his toughest challenge yet: how do you redeem the irredeemable? Sea levels are rising, trees are being ravaged, and jazz may be the only thing that can save our humanity from the Man of Steel. Dance on Bones is inspired by and structured around jazz music, riffing off of the folklore of the jazz scenes in St. Petersburg, Russia and New Orleans, Louisiana; creation myths; flooding cities; and the current environmental circumstances washing away our shores. Dave White is a playwright and Associate Professor at Towson University. His work has taken him on several fellowships to Slovakia, Poland, and Russia, including a Linkachev Cultural Fellowship in St. Petersburg, Russia for Dance on Bones. Dave’s plays have been presented by theaters in Colorado, Maryland, Missouri, New York, South Carolina, Texas, West Virginia; Art Faq in Moscow, Russia; and the Ilkhom Theatre in Tashkent, Uzbekistan. You can find more information at davewhiteplaywright.com. Solas Nua in Boston on September 22nd! 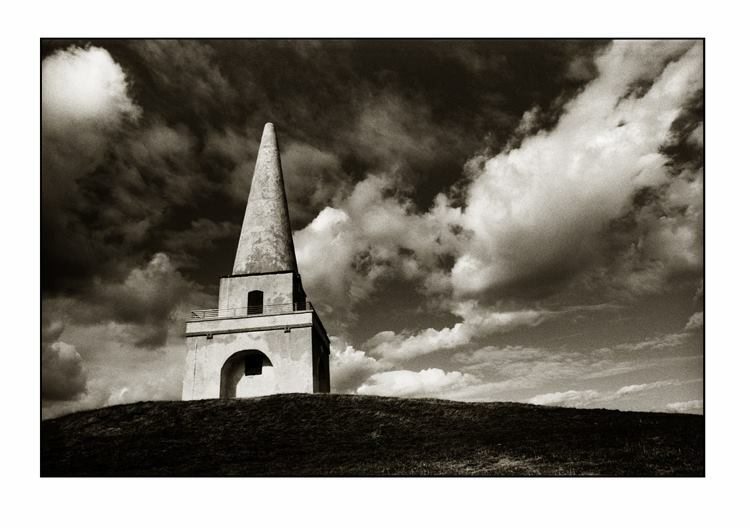 I'll be taking part in a staged reading of a new Irish play called On City Water Hill, by emerging Dublin playwright Philip St. John. It will be performed alongside another play called Innocents, also by St. John. The performance is with Solas Nua in Boston (an extension of the famed Solas Nua of Washington DC) and will be performed at The Burren in Somerville, Massachusetts on September 22nd. On City Water Hill was first produced by Turnaround Productions at The Theatre Upstairs in Dublin in 2014. Innocents is a world premiere. Jamileh Jemison (Solas Nua company member, Solas Nua in Boston producer) will direct. Open seating at 6:30 PM. The performances are set to begin at 7pm. One night only. This event is free. You can link to the Facebook event for this reading HERE!